The sky is never truly dark. The Earth doesn’t need the right Snapchat filter to get a healthy glow in photographs. Take the example of this beauty which NASA released on Tuesday featuring a beautiful starlit sky behind Earth, taken by an astronaut aboard the International Space Station (ISS) in orbit about 250 miles above Australia. In the image, which hardly depicts a “pale blue dot”, the Earth is instead depicted emitting a brilliant, bright yellow-orange glow. The photo was taken on October 7, and showcases a phenomena in Earth’s upper atmosphere past the ozone layer: airglow. Our understanding of airglow is thanks to the Swedish physicist Anders Ångström, who was the first to realize that the sky never quite reaches complete darkness. Originally fascinated by the temporary beauty of the Northern Lights, he identified the source of this sky’s perpetual glow as airglow in 1868. Earth’s atmosphere is primarily composed of nitrogen and oxygen, along with other trace elements. Exposed to sunlight, ultraviolet radiation excites these particles. To shed the extra energy, the molecules release photons, or light particles, which together, create a dim, colorful glow in the Earth’s upper atmosphere, called the ionosphere. 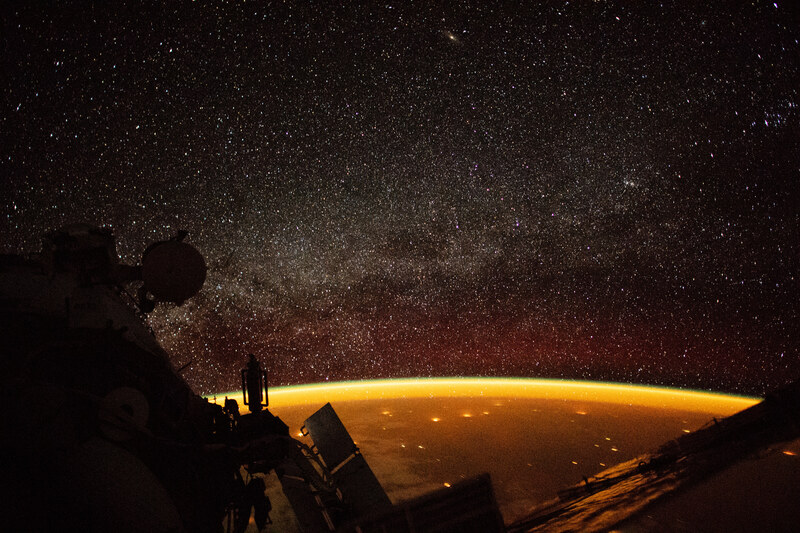 Different colors of airglow inform researchers about how weather patterns in the ionosphere. But airglow is more than a cloud of pretty colors to observe. The ionosphere where airglow exists lies at the intersection of Earth’s atmosphere and proper space, meaning the region is subject to both Earth weather and space weather — a meteorologist’s nightmare. Understanding how this region works is crucial to those in space and on the ground, since astronauts, satellites, and communication signals (think radio or GPS signals) call the ionosphere home. To better understand this busy, glowing band of the atmosphere, NASA partnered two missions, the Ionosphereic Connection Explorer (ICON) and Global-scale Observations of the Limb and Disk (GOLD) to provide scientists with close-up and landscape images to build a comprehensive look at the region. So glow up, Earth. NASA is preparing to launch the most detailed photoshoot of your life.